Women in the Scriptures: Who Cooked the First Thanksgiving Meal? John Alden and Priscilla Mullins, my ancestors! The kids and I read a wonderful book about the Pilgrims the other day for school. It had lots of information about them that I had never learned before, including the fact that only 5 of the 18 women who sailed on the Mayflower survived the first winter! Just think of that ladies. That means that there were only 5 women who cooked the first Thanksgiving feast--a feast that lasted three days and fed an entire pilgrim colony and 90 Wampanoag Indian men. Hats off to those five women! Don't forget to give them a tribute sometime this Thursday when you are starting to get overwhelmed by the stress of preparing your grocery store turkey with your stuffing from a box and your cranberries from a can. They had a much bigger job! One of those five women who cooked the first Thanksgiving meal was Priscilla Mullins, who happens to be one of my great-grandmothers. Several years ago my grandmother's cousin did all the genealogy work and submitted it to the Mayflower Society, so I am a bona fide descendent! Which is neat. Priscilla was eighteen when she boarded the Mayflower and traveled with her father, mother and brother Joseph to Plymouth. During that first hard winter in the New World Priscilla lost both her father, her mother, and her brother to sickness-- making her an orphan and completely alone. She is recorded as being sweet in temper and blessed with great patience. 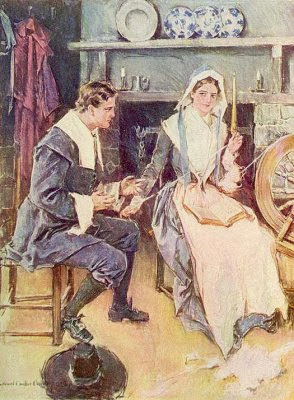 She was talented at spinning and spun wool and flax for the pilgrim colony, as well as taught school to the children and helped with the cooking. She also happened to be the ONLY unmarried woman in the colony of marriageable age, which obviously made her much desired. There is a famous poem called the "The Courtship of Miles Standish" by Henry Wadsworth Longfellow that tells the story of Priscilla's courtship. According to tradition the newly widowed Captain Miles Standish, who was the only solider in the colony, wanted to marry Priscilla. He asked his friend John Alden to propose to Priscilla on his behalf, to which Priscilla famously responded, "Why don't you speak for yourself, John?" So he did, and won the girl. 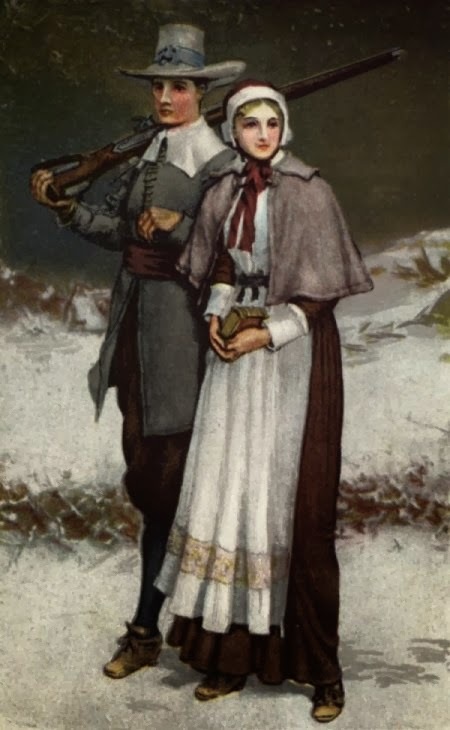 Priscilla and John Alden, who was the cooper (barrel maker) of the colony, were married around 1622 and would most likely have been the third couple to marry in the new world. They had eleven children and now have thousands of descendants.. The poem from Longfellow (who was a direct descendent of John and Priscilla) was long thought to be a romantic family tradition, but recently scholars have found that the story had been handed down and was first published by John and Priscilla's great-great grandson in 1814 (source). So there is likely some truth in the story. Which means that I come from the line of a strong-minded woman-- who even if she was the only available woman-- wasn't afraid to speak her mind and get what she wanted. That is a heritage I don't mind passing on. Especially if it comes with super-awesome-cooking-thanksgiving- for-a- huge- crowd skills! Which, by the way my mashed potatoes turn out, I'm thinking it doesn't. We read some books about the pilgrims this last school year and loved reading about Priscilla and Captain Standish and all the others. Recently my baby began standing on his own, so my little girls started calling him Miles Standish because he was standing. Ha ha! I'll have to look up that poem by Longfellow, it sounds interesting. Oh man that is cute! Don't you love it when your kids actually remember what you read them... Enough to be clever with it. Hey, I'm one of their descendants too. So I'm saying that makes you family, Heather. Woohoo! Hope you had a good Thanksgiving! Yay! I knew we were related somehow! Just had to be. Loved the blog post! I am also a descendant of John Alden and Priscilla =) I am a relatively new reader to your blog. Thanks for the wonderful posts.